With Excel 2010, Microsoft introduced something it calls a slicer. This is an independent object that acts as a filter for a PivotTable (and its associated PivotChart, if any). 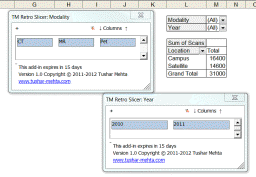 TM Retro Slicer enables some of the features of a slicer in older versions of Excel particularly Excel 2007 and Excel 2003. For example, Figure 1 shows a PivotTable shows the number of scans done only for specific technologists (those whose names appear in a blue background in the slicer). 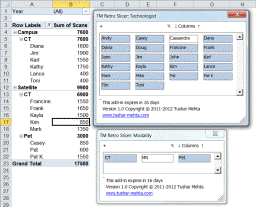 A PivotTable can have multiple slicers filtering data in it. 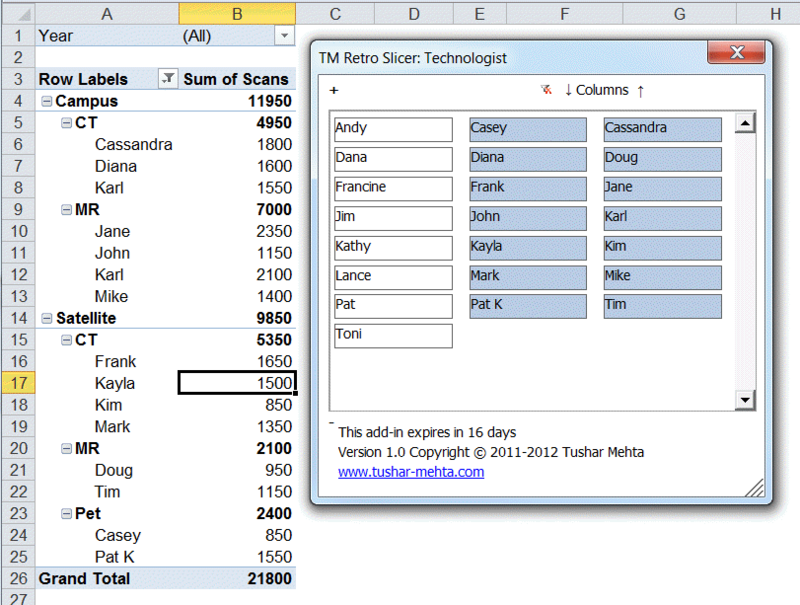 Also, the slicer object is customizable in terms of the number of columns used to show the item values. For example, Figure 2 shows the PivotTable filtered to show data for all technologists other than Cassandra and to show data only for CT and Pet scans. 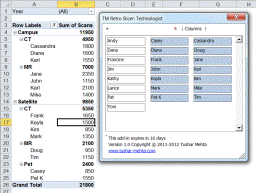 While Excel supports filters for pivot fields, the UI is less that friendly. The Slicer UI, on the other hand, is very easy to understand and use. One feature that Excel does not support natively is filtering data on fields not present in the PT. The 2010 slicer enables this capability. 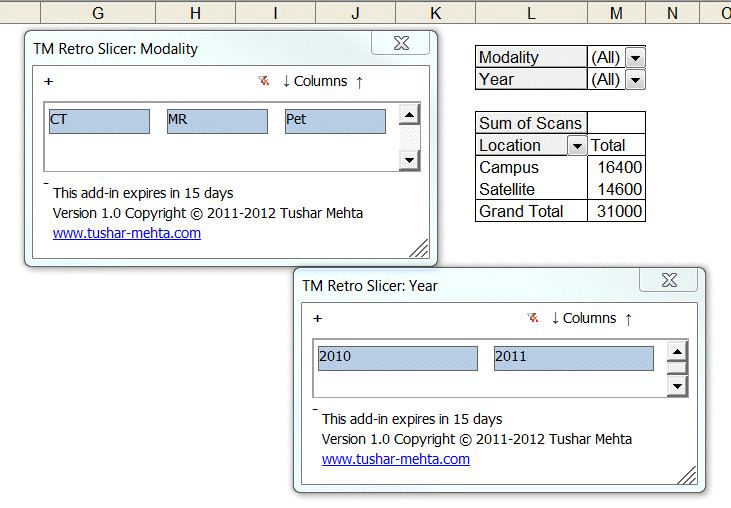 With TM Retro Slicer one can also add a slicer for an element not present in the PivotTable. However, to make the slicer work correctly, the add-in will add this element as a page field in the PT. Start by downloading either the self-installing version or the zip version. Download sample workbooks for 2003 and earlier or 2007 and later. Please use this period to evaluate the product before registering it for continued use. A single-user license is just USD19.95. A volume discount is available. When Microsoft adds a feature to Excel, it is in a position to thoroughly integrate it into the product. That luxury is not available to add-in developers. 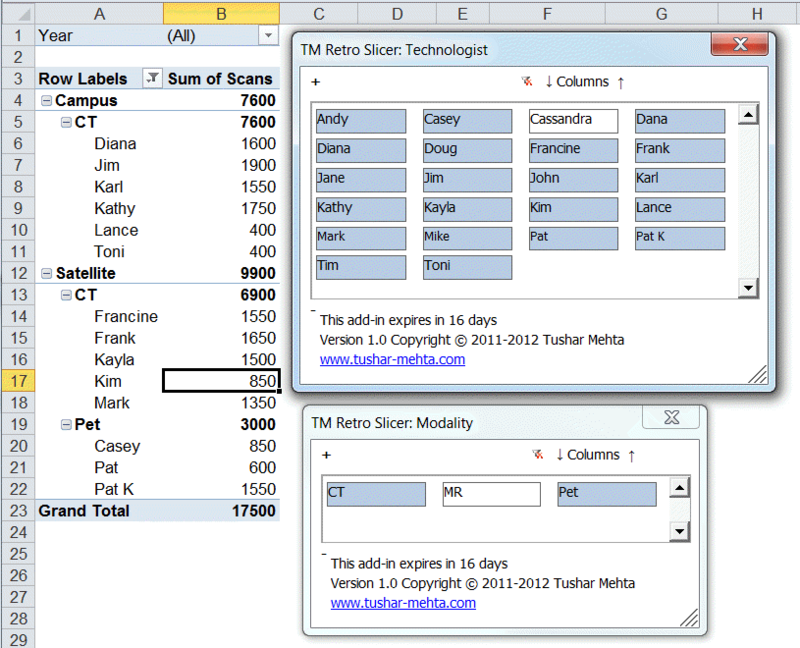 So, there are limitations in how seamlessly TM Retro Slicer integrates with pivot tables. Please check the documentation to understand how the add-in will improve productivity and how it interacts with pivot tables in all versions of Excel.